If you are one of the three thousand subscribers who received a copy of the Tallahassee Real Estate Newsletter yesterday, then you know that it contained some good news (finally) about home sales and a potential housing market bottom in Tallahassee. Have we seen the housing market bottom and how much longer are we going to have to work through this housing market crisis? In order to understand how much longer the real estate market correction is going to take, I have created a real estate graph and an analogy to explain our current situation. First the analogy. Imagine you are in the backyard of your Tallahassee home, and you have a shovel. Every time you dig into the ground to make a hole, you deposit the dirt into a pile. In theory, the depth of the hole is equal to the height of the dirt pile. If you decide to refill the hole, you just put the dirt from the pile back into the hole. Now imagine the real estate market is like your back yard. We know that over time, a certain percentage of our population is going to move, and if we track long enough, we can correlate the number of people moving to the population size in any market. The numbers go up, and the numbers go down, and these variations are what we refer to as market cycles. But over time, when we level out these real estate market cycles, we can establish an "expected level" of sales that should rise or fall slightly with the change in population over time. Are you still with me? In the graph above, I have used the method described above to calculate the expected level of home sales in Tallahassee over time, using our population data. Then I have either dug a hole or piled dirt based upon the home sales activity. The scale for "how many homes are in the dirt pile" is on the right, while the average number of daily home sales (green) is shown on the left axis. The image above shows some important information. First of all, the green line might show a housing market bottom a few months ago. 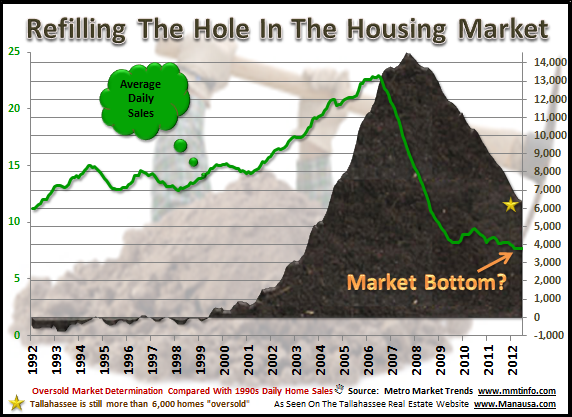 If the housing market bottom was reached, we should be able to know this with confidence in about six more months if the growth in Tallahassee home sales becomes a bit stronger. Secondly, look at how high the brown dirt pile grew by 2008. The market was more than 14,500 homes "over-sold." Using a reversion to the mean analysis, this suggests we have a recovery that must sell fewer than the "expected level" for as long as it takes to shovel in the 14,552 homes that are sitting in that brown dirt pile. So if the "expected level" for 2012 is about 5,500 homes, but we only record 3,400 home sales, then we will reduce the dirt pile by (5,500-3,400=2,100) just over 2,000 homes this year. The good news is that we have worked-off (shoveled) more than 1/2 of the pile ... but the bad news is that we still have more than 6,000 homes left in the over-sold pile (see the gold star). This graph best shows why I believe we will see a growth in daily home sales moving forward, but we will continue to see the market "under-sell" for many more years as we continue to reduce the dirt pile. This is simply just tracking the predicatable real estate market cycles, and it means that Tallahassee home values will face pressure from a glutted situation for quite a while longer. If you want to stay informed in regards to the current state of the Tallahassee real estate market, you really only need to do two things: First, subscribe to the Tallahassee Real Estate Newsletter (see purple form below), and subscribe to the Tallahassee Real Estate Blog (see gold form above the blog). You'll be well informed and you will be certain of future trends as well as whether or not we have passed the housing market bottom.